Cuyahoga Community College (Tri-C®) will showcase the bold, colorful and humorous creations of three regional artists during a monthlong exhibit now on view at Western Campus. The exhibit runs through Nov. 21 at Gallery West, located on the second floor of the campus library. Gallery hours are 8 a.m. to 8 p.m. Monday through Thursday and 9 a.m. to 2 p.m. Friday and Saturday. An opening reception will be held 5-7 p.m. Wednesday, Oct. 24. The exhibit is titled Th-Th-That’s All Folks. 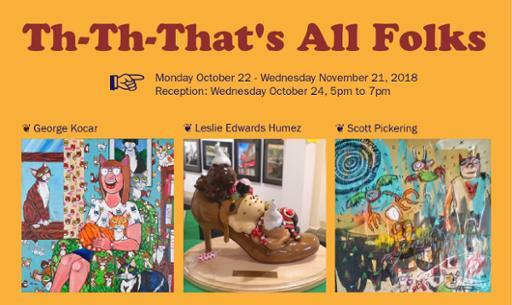 The show features the work of Leslie Edwards Humez, a 3D pop-surrealist; George Kocar, an over-the-top painter of social satire; and Scott Pickering, who has left his colorful mark on buildings around Cleveland. Free parking is available at Western Campus, located at 11000 Pleasant Valley Road in Parma. For more information, call 216-987-5322 or visit www.tri-c.edu/gallerywest.